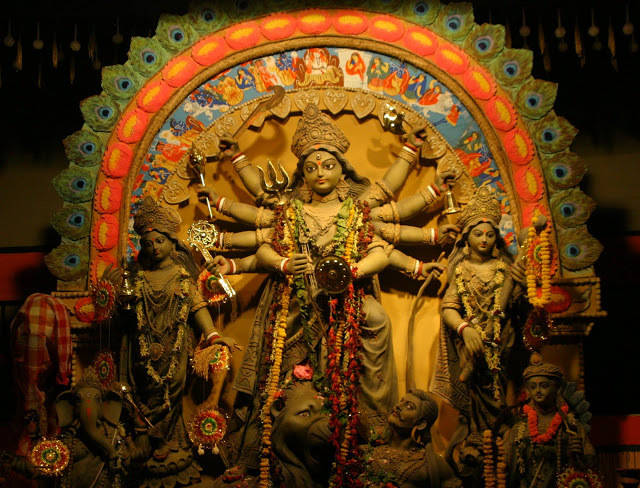 Durga Puja came and went. Although India doesn’t have an Autumn and its share of auburn leaves, this time of the year is the closest one can get to ‘Fall’. Autumn has always been homecoming and times for families to get together. Sometimes, this intention is not always as you would have wanted it. This year, not everything was happy and joyful. On and around Vijaya Dashami, few very precious people on earth held the deity’s hand and went on their brisk return to the heavenly abode. Like they say, ‘Even the Gods need good people’. The skies were overcast and grey most of times. The nip in the air impertinent. The kaash and the pawlaash bloomed,alright- but unlike every year, this year, the joy was mutilated. 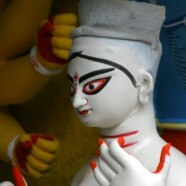 I have been living without being in Kolkata for the festival for almost 8 years now. And Bangalore has never made me miss my home-city, in all honesty. I have friends who I can call family here. And if am not mistaken, there are at least 60+ puja pandals that get installed in Bangalore around this time. Much of the essence of the festival dwells in these neighbourhoods during these four days. The addas remain intact. 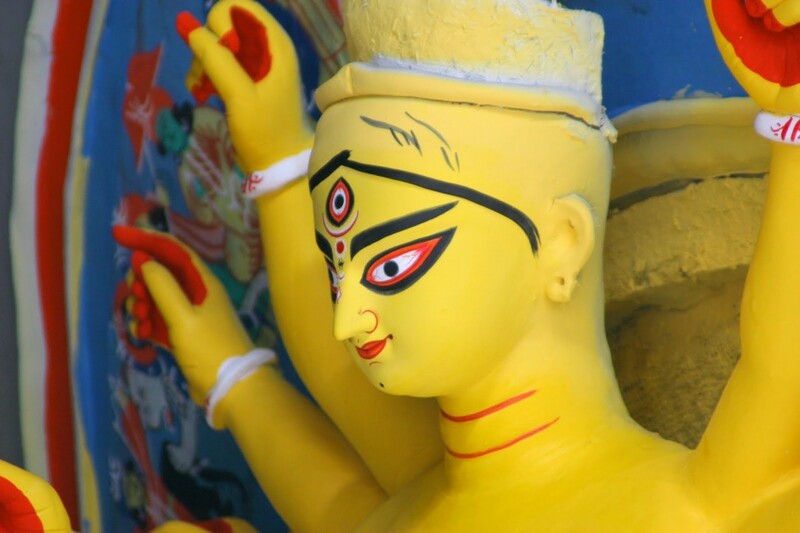 The dhaak serenades the deity and her family in several parts of the city. The yearly ritualistic Dhunuchi Naach, has its share of admirers. The kids wear their new clothes, and we have our share of adult materialistic pleasure of shopping for exquisite sarees, kurtas and bags. The excitement of the various Bengali ‘celebrities’ giving their darshan, still causes a flutter or two; the enthusiastic cultural diaspora of talent, still carries on, and heralds hoards of family and friends to cheer them on. This time, everything was like last year’s but yet I was missing something. And then I realized, what it was. I was missing home food. Home food made by Ma. All the kababs, all the biriyanis, all the rolls and chops and the roshogollas couldn’t make me forget what I was missing. I have some staple favourites that belong to Ma. It isn’t a proprietary preparation, but I think what makes it stands out is the touch of her nimble fingers. Its also to do with the simple fact that each memory we have is intertwined with either of our five senses. 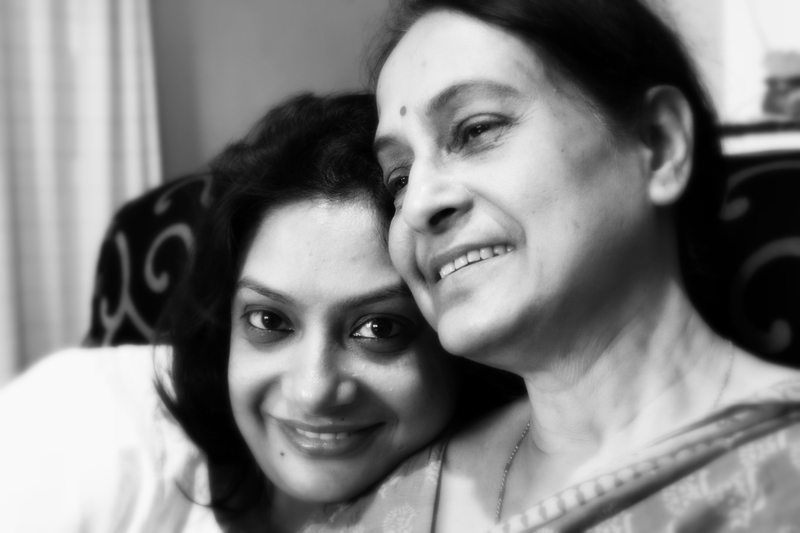 While I may remember the look in the eyes of my lover, everytime we would have seen the full-moon together, I may also remember the smell of Ma’s towel, that she would have unfurled from her hair after an evening summer shower in Kolkata. I probably see Ma step out of her shower thrice every year, ever since we stay in different cities…but the smell and its memory is distinct as if she was right here, right now. Predictably, my memories of food are finely weaved with a strong sense of smell. One such aromatic memory is this. 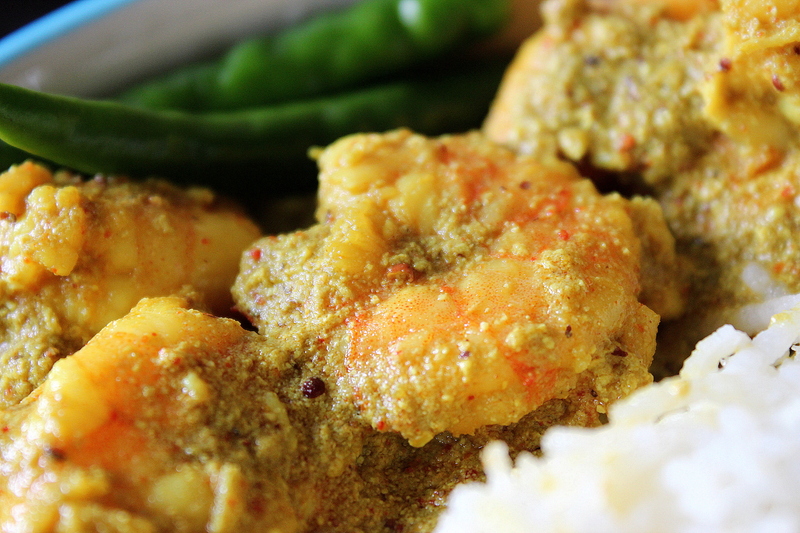 Absolutely easy to make ‘Shorshe Chingri’ (or River Prawns in Mustard Sauce) . Everytime I think of this dish, my nose tickles and my eyes water out of sheer joy! Do this exercise, will you? Spot the nearest Bengali around you.Whisper ‘ Shorshe Chingri’ casually. You will be amazed how spontaneously your friend’s face will brighten up! 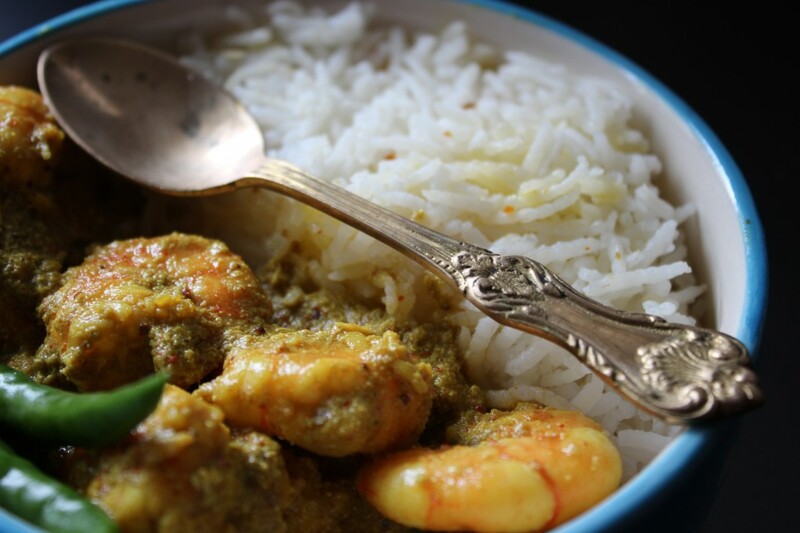 The sound of Shorshe Chingri evokes music in the hearts of us Bengalis. This is a quintessential dish, made with mix of pungent mustard paste, optional poppy seed and coconut paste, slender green hot chilly peppers, a generous drizzle (oh, well-lets just say pourings! )of mustard oil and for me there is an inevitable doze of nostalgia! The other is rather a cultural delicacy, that can only be made into a favourite if you or your genes belong to a certain geography, and you belong to a ‘clan’ dubiously famous for its existence and practice of keeping the legacy of this dish alive. We call it ‘Shutki Maach’-The Dried Fish. It comes with the aroma(I hate when people call it a smell!) that is only possible when the air is mixed with the saltiness of the sea and made sultry with the amber heat of the Bengali country sun! This heady and rustic mix of the salt and the sea belongs to Chittagong(in Bangladesh) and the nostalgic plate of food that I kept reminiscing about all through this Durga Puja is ‘Nona Ilish’ (Salted & Dried Hilsa). 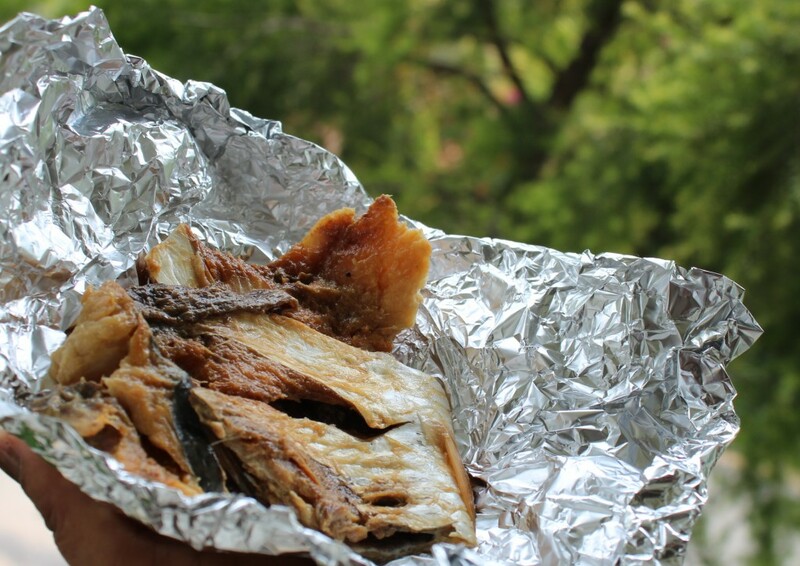 Sun dried salted Hilsa fish can be preserved for 1-2 years. My ‘stock’ was hand delivered by my brother, and it came in all the way from Bangladesh. Customarily,the hilsa is preserved with salt so that fish lovers can be happy during those torturous months when raw fish is not available. A layer of the fish is mixed with salt and kept in an earthenware pot. A second layer goes on top and so on till you reach the mouth of the pot, which is sealed with a muslin cloth. In olden days, this contraption used to be buried under the ground for months. The fish needs to be washed several times in hot water allowing the soluble earth and the excess salt to drain out. Clean, de-vein and cut the head and tails of the prawns. Mix it with turmeric and salt. Keep aside. Soak mustard seeds in water and a little bit salt for more than 1 hour otherwise it will be bitter to taste. Now grind the mustard seeds along with 4 to 5 chilies and a pinch of salt. Keep aside. In a tight lid box grease mustard oil. Mix in the prawns, mustard paste, and the poppy/coconut paste, if you are using it Add raw mustard oil and one or two slit green chilies. Pour water in the pressure cooker. Put the box inside the cooker in a stand. Make sure the water doesn’t go inside the box. Wait for two whistles. Takes about 4-6 minutes. Garnish with slit green chilies and pour a generous drizzle of the remaining mustard oil. 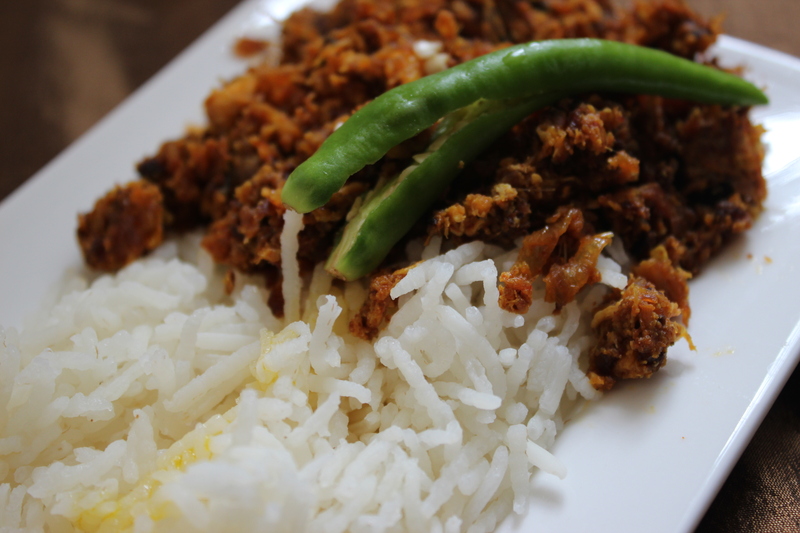 Serve hot with plain white basmati rice. In the microwave, this recipe takes a little more time. I personally don’t recommend it to be made in the microwave, as the prawns might turn a little rubbery, if kept beyond the required time. Take a microwave safe bowl. Grease a little with mustard oil. Mix in the prawns, mustard paste and the poppy/coconut paste. Add raw mustard oil and one or two slit green chilies. 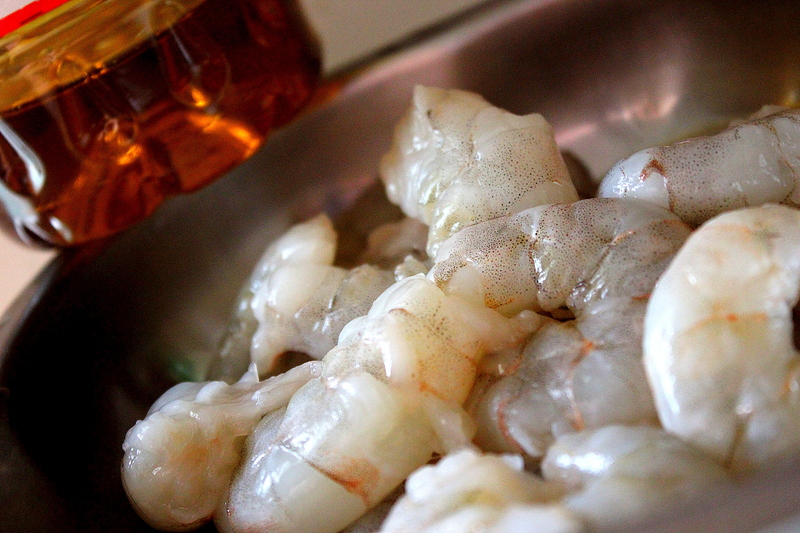 Cook the prawns for 12-15 minutes on a High. Garnish with slit green chilies. Serve hot. Tip: You can also add a little beaten yoghurt, to get a slightly thicker consistency, just in case you do not want to use the coconut/poppy seed paste. Be careful, not to use the yoghurt in plenty, otherwise it might subdue the pungency of the mustard paste. But if bringing the pungency down, to suit your personal palette is the preference, a little more yoghurt, it is! Wash the Nona Ilish or sun dried salted hilsa fish. Cut it into small pieces. In a kadai, bring a generous helping of mustard oil to smoking point. Add the onion and garlic pastes, turmeric, sliced green chillies and red chili powder. Remember categorically NOT to add salt! Add the salted sun dried fish slices.The fish will release its own moisture. Stir and cook until the ingredients are mixed well, and the water dries up a bit and the oil starts to simmer on top. If you are using eggs, in a separate bowl, beat the two eggs. While the potion simmers, add the beaten eggs, while continuously stirring around the kadai. The end product should look disjointed and fragmented. Almost like slender fritters. The strong smell of the spices will be gone as well, and the fish pieces will become oily and fried .Sprinkle some of the green chilies, another generous ladle of mustard oil and simmer for 3-4 minutes more. feeling very proud to see that u r bringing in certain special recipes that are from Chittagong only into limelight. Hope people having their origin from Chittagong find it interesting & nostalgic. Thank you! Let me just say, I can only be hopeful of doing such a noble job in the way I know best. Write. And write about food. I am sure there are plenty of patrons that do much more than this to keep the legacy of these recipies alive. Let Dida and Khokonmaama read it! This reminds me of Sutki Maach with haasher dim that was so much a part of my visit to birati and thamma’s cuisine. In all reality a certain smell is so much intertwined with birati that it still wafts into my nostrils if I close my eyes and think about it. I always pined for that other half of that sunset yellow egg that thamma would customarily cut into two.Its been years since I tasted anything that thamma cooked, but then I would still call her the best chef whose dishes I have ever sampled. Now I need to see if I can find dried hilsa here in US. Hey Tandi! Try any well stocked Bangladeshi shop for the Nona Ilish. If you dont, you could check the Vietnamese local market for dried fish. Any dried fish can be made in this manner, actually. 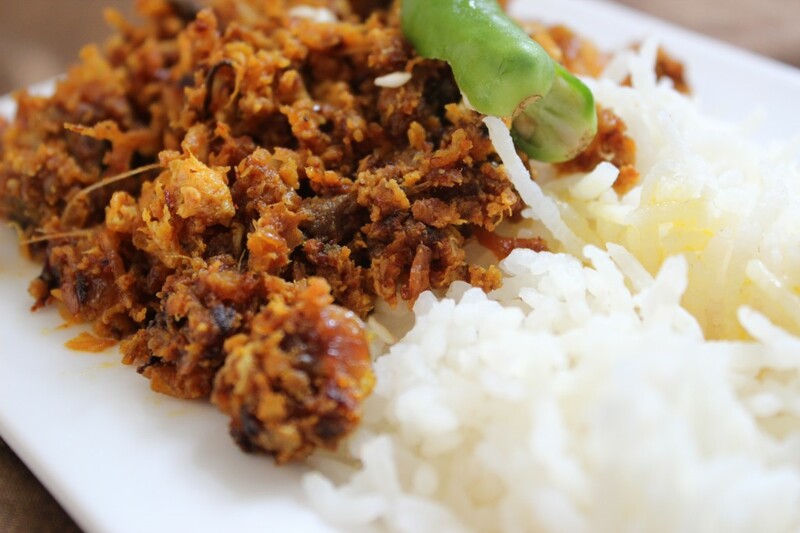 Bombay Duck, dried sword fish, dried prawns… Try! And hey, thanks for the compliments. Jham! You brought back a whole saga of memories for me too. Instantly that dining table in Birati came back blinking in front of my eyes. Along with it, the small table fan that was kept beside it for hot summer afternoons, that small red fridge, the mid-shelf(pronounced ‘self’) near the Thakur Ghor, the wooden board in which keys were hung, just outside the bedroom.. I miss all that. And Dadubhai. When I make these at home, it isnt half as delicious as what Dida’s or Ma’s cooking. But I just want my children to grow up loving these smells. Welcome, Sritama! Will have it, when you make it here in Bangalore!